Common Rats: those long-tailed murine rodents that scurry about and make (most of) us shudder with revulsion. 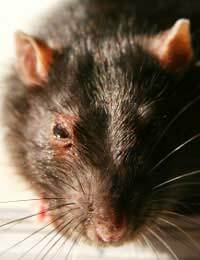 Rattus norvegicus in particular is just about everywhere in the world and, as a species, rats are the most significant urban and rural pests: capable of spreading diseases dangerous to humans and contaminating both human and animal foodstuffs. It is estimated that there are in excess of 70 million rats in the UK. Females are sexually mature by the age of 2-3 weeks, can produce 8-10 young a month and live for around three years. Rats can pass 50 droppings and 12-16mls of urine in a 24-hour period and the rodents’ continued gnawing of cables is thought to be responsible for around 50% of farm fires. Adult rats can grow to the size of a small cat. They have a hairless tail that measures 150-200mm in length.One way or another, the damage caused by rats’ costs our farming industry alone between £14-18 million a year. This ancient profession is also known as ‘Pest Control Officer’ ‘Vermin Eradicator’ ‘Rodent Inspector’ and a number of other things! Finding the source of burrows is one of the things Darren does on his first visit to a new client. Many of the rat infestations Darren deals with can be traced to drains in need of repair. “If there’s a hole in or around a drain, that’s usually where the problem lies.” He recommends that people employ a builder to repair any broken-down areas and to cover drains with wire mesh. Once the suspected rat-runs, burrows, water, shelter and food sources have been found, there are several treatments available to free the area from its rodent population. Among the specialist treatments available to professional pest-controllers, are poison-bait traps and contact dust. Most infestations can be successfully eradicated with just two visits from the rat-catcher, within a space of one week to ten days. Darren wears protective gloves to carry out his work and uses a facemask when powdering burrows with contact dust. He cleans his hands with anti-bacterial gel at appropriate times throughout the working day.